I had my weigh in today and I have good news to report. I lost 3.6 pounds this week! I am finally in the 150's. Now my new goal is to get into the 140's. I absolutely love Weight Watchers. I have learned a lot from going to the meetings and I enjoy making these healthier, but tasty recipes. It is amazing to know that there is so much that you can eat while on a diet and I think that is why I failed in the past. I used to deprive myself, easily got bored with the same old foods, and always thought I had to eat salad every meal of the day to lose weight. As we all know, eating the same foods all day and not getting enough calories in our body never works in the long run. When I get to my goal weight, I do not want to go back to where I was before starting Weight Watchers. No more yo - yo dieting, crash diets, and binge eating... I am looking forward to a lifestyle change. Watch out for the new me! As for the recipe...This recipe really does taste like a scrumptious caramel apple. 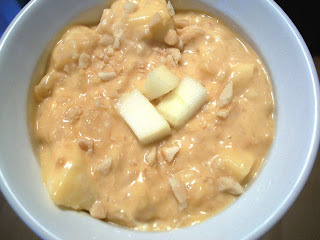 The butterscotch pudding mix blended with cool whip with the added peanuts, pineapple and apples taste sooo delicious. It doesn't seem like a weight watchers recipe at all. The only changes I would make would be to add only a 1/2 cup of peanuts rather than 1 cup and add more apples. It is just a preference of mine. I just didn't think it had enough apples in it but yet, I tasted plenty of peanuts. I used Gala apples instead of Granny Smith apples because they happen to be my favorite type of apples. This is awesome for pot lucks. Yummy Yummy! Add pudding mix to undrained pineapple and mix well. Add apples and peanuts. Fold in Cool Whip. Serve immediately or refrigerate to store. Wow!! Congrats on your loss!! I love WW too! It is so nice to be able to eat normal food and just track the points...and not feel deprived! Sandy, I am dancing with delight for you. Outstanding accomplishment! Good on ya! You go girl!! !